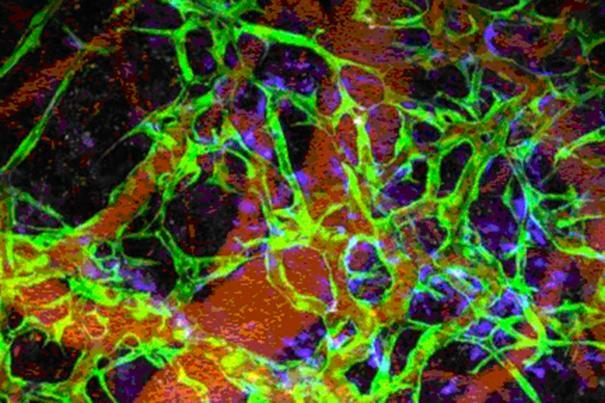 Caption: Insulin-producing pancreatic beta cells (green) derived from human embryonic stem cells that have formed islet-like clusters in a mouse. The red cells are producing another metabolic hormone, glucagon, that regulates blood glucose levels. Blue indicates cell nuclei. For most of the estimated 1 to 3 million Americans living with type 1 diabetes, every day brings multiple fingerpricks to manage their blood glucose levels with replacement insulin [1,2]. The reason is that their own immune systems have somehow engaged in friendly fire on small, but vital, clusters of cells in the pancreas known as the islets—which harbor the so-called “beta cells” that make insulin. So, it’s no surprise that researchers seeking ways to help people with type 1 diabetes have spent decades trying a find a reliable way to replace these islets. Islet replacement has proven to be an extremely difficult research challenge for a variety of reasons, but exciting opportunities are now on the horizon. Notably, a team of researchers, led by Douglas Melton of Harvard University, Cambridge, MA, and partially funded by NIH, reported groundbreaking success just last week in spurring a human embryonic stem cell (hESC) line and two human-induced pluripotent stem (iPS) cell lines to differentiate into the crucial, insulin-producing beta cells. Not only did cells generated from all three of these lines look like human pancreatic beta cells, they functioned like bona fide, glucose-responsive beta cells in a mouse model of type 1 diabetes .